I’m a regular visitor to The Art of Manliness – a very successful blog for men headquartered in the US of A. Every so often they have articles about meat. The last one I published (with permission) was about the joys of cooking bacon. Skirt steak in New Zealand is traditionally not well regarded. It’s very flavoursome, but not very tender. But, if you know what to do with it, and how to handle it, it can be a very nice piece of meat indeed. A few weeks back, I had the opportunity to dine with friends at one of NYC’s hipper steakhouses. For those who’ve spent time reading my work, it shouldn’t surprise you that I typically don’t like to frequent places that are considered both trendy and expensive. Nevertheless, I was in the company of a few investment banker friends, so I shut my mouth, ordered, and graciously accepted their offer to pick up the tab. After all, I was a guest in their city! As much as I hate to eat crow, I will confess . . . the place was awesome. Aside from the fact that the atmosphere sported over-the-top décor and “club music,” my meal was fantastic. The best part? The highlight of their menu was not a traditional filet, rib-eye, or porterhouse. Rather, the specialty of the house was my favorite cut of all: the skirt steak. For those unaware of this cut of steak, allow me to enlighten you. Skirt steaks are actually the diaphragm muscle, located in the area just below the ribs on the cow. The outer skirt steak is from the plate section, below the rib and in-between the brisket and flank. For the outside cut, butchers will typically leave the membrane attached, which should be removed before cooking. Simply use a sharp knife to cut and pull away this membrane before cooking. More commonly, you will find the inside skirt steak at your local grocery store. This cut is a bit thinner, trimmed free of fat and membranes, and comes from the flank. Regardless of either cut, this long, flat strip of meat has incredible flavor, but has often been considered tough and mysterious to outsiders (except Texans who swear by using skirt steak for fajitas). However, the secret is finally out. When marinated and prepared correctly, this cut is an excellent choice for flavor, value, and versatility. Not surprisingly, an increase in awareness in “alternative” cuts has spawned somewhat of a movement in the restaurant world. Diners are branching out by choosing these types of cuts (skirt, flat-iron, hanger, flank) over the more traditional steakhouse fare. If you ask me, it’s a win-win for both diners and restaurateurs. As patrons, we are stepping out of our comfort zones by enjoying new types of cuts, preparations, and flavors. Restaurants are cutting back on expensive food costs by serving more “humble” cuts to intrigued diners. The end result? Better value, great flavor, and a new experience. To get the same results at home, I’ve provided five outstanding recipes that will showcase the superb versatility and flavor of this cut. A common attribute of all of these recipes is that skirt steaks take well to high heat. Such heat will render the fat (flavor) and also allow you to prepare these meals rather quickly. Always be sure to slice the steak against the grain and at an angle–this will ensure maximum tenderness. Crack open a cold beer and get to work! Onions: In a skillet over medium low heat, combine oil, onions, and kosher salt and sauté for 25 – 30 minutes, stirring on occasion until onions are browned and tender. Mayo: Combine minced garlic and kosher salt onto a cutting board. Using the flat side of a chef’s knife, work the ingredients into a paste on the board. Combine garlic paste with mayo and remaining ingredients. Cover, and keep chilled until ready for service. 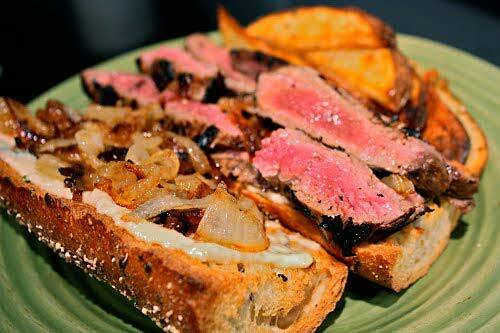 Sandwich: Slice French bread into approximately two 6 – inch servings. Next, slice the bread horizontally to create a sandwich top and bottom. Place each slice under a grill for 30 seconds – 1 minute, or until slightly browned and crispy. Meanwhile, drizzle extra virgin olive oil over the skirt steak and season both sides liberally with kosher salt and fresh cracked pepper. Add steak to a grill/grill pan over high heat and cook for approximately 2 – 3 minutes per side for medium rare. Remove steak from grill and set aside to rest for 3 – 4 minutes. Begin assembling sandwich by spreading a layer of mayo on each side of the toasted bread. Next, thinly slice steak across the grain and add to the bottom portion of the sandwich. Top with caramelized onions and serve. : an hour or so daily To access the video, click here.